This group accommodation has an excellent ambience and is in a fantastic location for family and/or friends. This former restaurant was converted into a group accommodation in 2015, and guests get to enjoy some great amenities as a result. These include a spacious kitchen with professional equipment and your own cafe with a bar (which includes a tap of course). 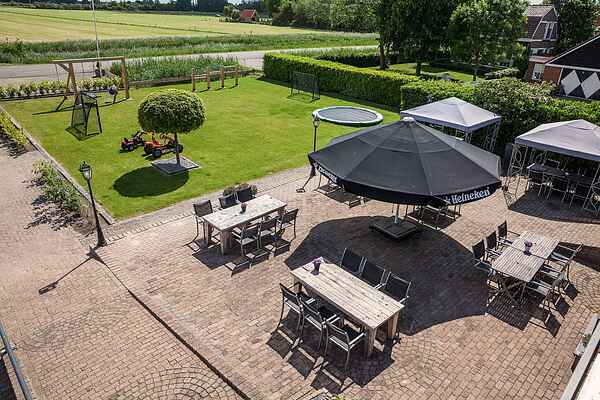 De Uitstap, as this holiday home is called, also has a large terrace with garden furniture. The children have also been considered. There is a lovely grassy field in front of the terrace, with a variety of playground equipment. There are a total of 7 bedrooms, 6 of which can sleep 3 people each. One bedroom contains 3 bunk beds, ideal for all the kids. In other words, you have everything you need to make your stay a great success! You will find many activities in the area round Rouveen. Some can be arranged via the owner, such as: paintball, workshops, klootschieten (road bowling) and other activities/team building. You can even have De Uitstap Group Accommodation provide the catering. The house caterer not only supplies complete meals but can also arrange drinks for you. This includes draught beer. For more information about catering and activities, contact our customer service department. There is no shortage of sights and attractions. The historic village of Staphorst (about 8 km), the lovely city of Zwolle (about 14 km) and the world-renowned village of Giethoorn (about 29 km) are definitely worth a visit. Nature lovers will also find plenty to see and do. With multiple nature preserves in the immediate vicinity, you can easily plan some great hikes and bike rides.